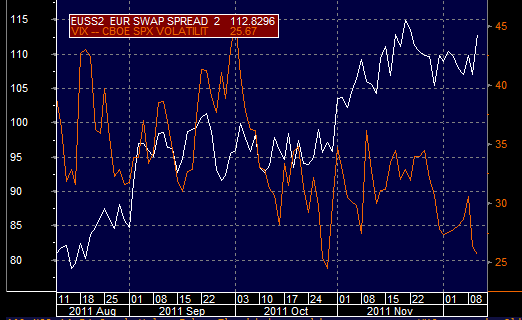 Euro swap spreads have moved up materially today with the 2-year spread rising 6bp to 113bp - near recent highs. That is clearly an indication of financial stress. However another financial stress indicator, the VIX has been moving in the opposite direction (lowering put "responsiveness"). This divergence is puzzling. Fundamentally it expresses a "decoupling" between risks in the US equity markets and risks in the EUR interbank funding markets. That decoupling is difficult to imagine because should there be a funding problem among European banks, it will definitely translate into risks in the equity markets. Nevertheless the market is telling us that participants are pricing these two risks differently with continuing credit tightness in Europe not necessarily translating into a significant slowdown in the US corporate sector. For those who feel the fundamentals don't justify such divergence, there is a trade in there somewhere.